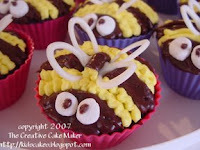 Nothing could be cuter than a swarm of bumblebee cupcakes at your party! These cupcakes are quick and easy. They don’t take much more than a box of cake mix, some colored icing and marshmallows. If you want to add the wings, you’ll need some vanilla candy wafers or some white chocolate to melt down. 1 standard box of cake mix (whatever flavor you prefer), baked in 48 cupcake liners and cooled. If you need assistance in baking and cooling your cake, please refer to these video tutorials on “How To Bake A Cake”. If you have not already done so, bake your cupcakes according to package directions and cool completely. If they not cooled, your icing will start to melt and slide off the cupcakes. First, fill one Ziploc sandwich bag (or similar brand) 1/3 full with some chocolate icing. Push the icing toward one of the bottom corners of the bag. Snip a small hole in the corner of the bag with your scissors. Twist the excess bag to create a decorating “piping bag”. Place the “twist” in the joint between your thumb and the rest of your hand. Close your hand over the rest of the bag. View a video tutorial for this step if you are unsure how it should be done. To decorate your cake, you will squeeze the bag. Try it a little on some wax paper to get used to it. Now, following the design on the picture, “pipe” an outline for the head of the bumblebee. Fill in the head with chocolate icing. Leave a small space and pipe another 2 rows of chocolate icing. Leave a second space and pipe the rest of the way to the edge of the cake with chocolate icing. Now, fill a sandwich bag 1/3 full with yellow icing. Just as you did with the chocolate icing, push the icing toward one corner and cut a hole in the corner. Fill in all the areas of the cupcake between the chocolate that still have cake exposed. For the eyes, place 2 halves of a miniature marshmallow close together at the front of the cake on the chocolate “head”. Then, pipe chocolate "eyes" onto the marshmallows. For the wings (optional), melt down your candy wafers or your white chocolate. This can be done in a double boiler or in a microwave. Place the melted chocolate in a sandwich bag and snip off a tiny hole in the bottom corner. Using the melted white chocolate, “draw or outline” pairs of wings (separately) on a piece of wax paper. They should look like the letter “B” or a sideways “heart”. Do not fill in the wings as this will make the wings very heavy. A simple outline of wings will do. Allow the wings to cool and harden. Gently remove them from the wax paper and place upright in your cupcakes. With the wings done, your cupcakes are finished! these are so cute! could you please post the instructions! Okay, Anonymous! Here are the instructions! If you have any questions, feel free to ask!